The Lenovo Ideapad S410p Touch laptop is quite a conventional budget laptop in this age of ultrabooks. While the trend these days is towards ultrabooks that is thin and light, or one that can even be converted into tablet form (such as Lenovo Flex series), I’m not buying into it yet. Maybe I’m just a bit conservative, but ultimately is for practical reasons and costs. For a mid-range laptop (less than RM2500 in Malaysia), being thin and light often sacrifices performance or built quality. Both of which comes high on my priority list for laptops. The Lenovo Ideapad S410p weights 2,3kg is not exactly light by today’s standard of ultrabooks (of around 1.5kg or less), but it’s an acceptable weight for this price range and specifications. The first thing that you’ll notice is the textured surface of the screen back cover. It’s made of textured plastic and doesn’t shine like some of the glossy surfaces. Its a hate it or love it. But in my opinion, its simple, nice and doesn’t attract much finger prints and smudges. Would be a further plus point if its brushed metal-aluminium. Upon opening the laptop, there’s the brushed metal giving a nice solid premium feel. A nice and cool to touch rest area for the palms. Lenovo’s island-style keyboard – AccuType is well spaced, decent tactile feedback. The little things that makes typing comfortable. But that can’t be said of the touch pad. It’s a bit small and lack sensitivity. Having used a MacBook previously (which has the best touch pad I’ve used so far), its quite frustrating and had a tough time getting the gestures to work on this Lenovo. A mouse is therefore a must. As this model also comes with a touch screen (there are also non-touch screen versions of this model), the hinges is quite sturdy although it does wobble if too much pressure is applied while touching the screen. I think it’s quite normal for most mid-range laptops with touch screen. The back of the laptop is covered by a one-piece of plastic that can be unscrew to access the memory slots and hard disk drive. So you may add more RAM or even change to a faster SSD HDD later. A plus point for this Lenovo in my opinion, as most slimmer ultrabooks these days no longer has such options due to the smaller form factor which this Lenovo is slightly thicker comparatively. The Dolby Advanced Audio v2 does enhances the audio output of the built-in speakers on the Lenovo S410P. It does definitely sounds a little noticeably better than a laptop without. But do not expect wonders from the tiny built-in speakers either. A good set of speakers or headphone would easily make better audio. 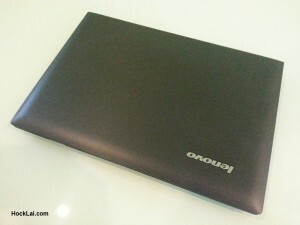 The Lenovo Ideapad S410P also excels better than most ultra books in terms of connectivity options. Featuring not 1 but 2 USB3.0 ports, and 1 USB2.0 port (for your mouse mostly), HDMI, VGA-out, Ethernet port, and a headphone/microphone jack. It’s knowing you have all these connectivities built-in for the times you need it. In a move to make laptops slimmer and lighter, most ultra books forgo the VGA-out and Ethernet port and made it as an add-on connector. Sometimes you’ll just need them, and not had the add-on connectors at hand to connect to a projector for presentation purposes (not all projectors are of newer models that comes with HDMI) or at a data center without wifi. And lets not forget the DVD-RW drive when you just needed it to read/write a disc. 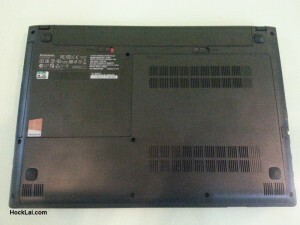 Besides the physical ports, the Lenovo Ideapad S410P also comes with quite a standard set of wireless connectivity for a laptop these days – WiFi 802.11B/G/N and Bluetooth 4.0. The WiFi reception of this Lenovo is quite good and stable although I do notice the signal strength bar fluctuates between 5 (full) bars and 4 bars even when it is stationary on my desk when I’m just a mere 5m aways from the wireless router. Being on the move doing what I do, and as much as the weights and dimensions of a laptop matter, the connectivity options on the laptop like the Lenovo S410P scores extra merits. I didn’t do much Benchmarking on this laptop for a proper test of this laptop’s performance. Only had a simple PCMark8 test on the Lenovo Ideapad S410P and it got quite a respectable score of 2191. System boots up in about 30s (cold start) and generally it runs all the tasks I throw at it at a respectable speed. As I no longer had much time to play some serious games that would tax the GPU, casual gaming is smooth and not an issue on the Lenovo S410P. 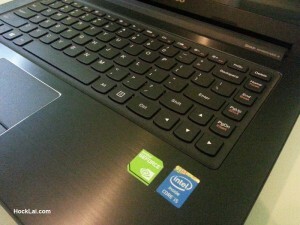 The Lenovo Ideapad S410P runs very quiet and cool. No heat was felt on the palm rest or any part of the keyboard surface for comfortable use. The bottom of the laptop is also rather cool with just some noticeable warm below the palm rest area (where the hard disk sits) during use. The laptop’s fan doesn’t makes any audible noise when running (which is good) and only runs occasionally when required. I guess this is all thanks to the improved power and heat management of Intel’s 4th-Gen Core processors and all the components in it. The 4-cell battery of this laptop is claimed to last up to 5 hours, and I must say it does quite well. Having tested on a couple of occasions, browsing the internet over WiFi, preparing some documents with screen brightness of 70%, the Lenovo Ideapad S410P does manage to last a good 4 hours 30 minutes before hitting the 5% critical battery level. The battery could provide enough power to comfortably watch a HD movie of about 2 hours length with some battery capacity to spare. I don’t usually like software/tools bundled with laptops. 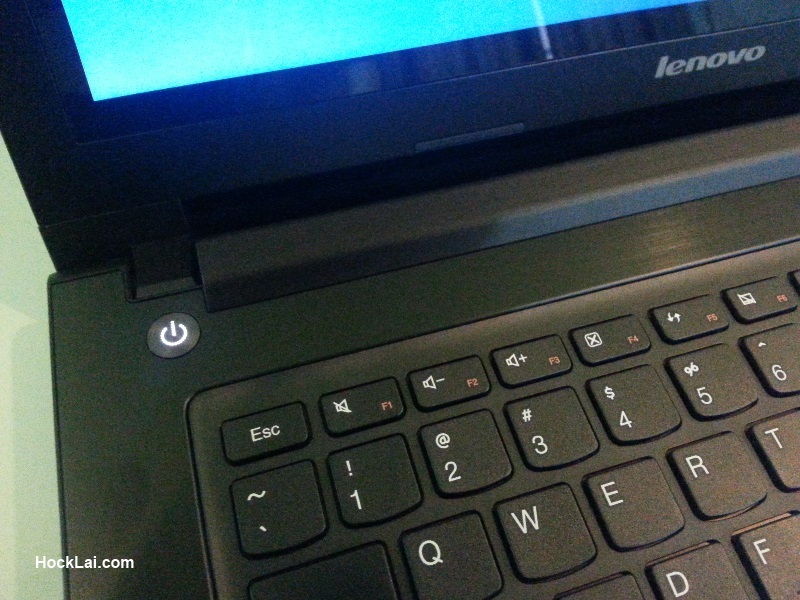 But Lenovo’s Energy Manager is quite useful to easily switch power mode and perform some simple maintenance like activating the fan blower to try remove dusts from the fans and fins. There’s also a battery conservation mode to maintain the battery charged at 70% to help maintain the lifespan of the battery. The Lenovo Ideapad S410P is a well featured laptop for all your needs with a decent performance and an affordable price. To further add more value, the Lenovo Ideapad S410P also comes with a 2 years international warranty to give the extra peace of mind and a 3 years subscription of McAfee Internet Security to keep it safe from viruses, etc. Overall, this is the best value for money laptop worth getting. Hi, I tried to add addtional 4GB RAM but it doesnt work. Why? It should work. Perhaps you might have to check on the memory compatibility and try a different brand/model of the RAM.